Apple’s new store promotion offers 100 Apps and Games at a very law price. You can get these applications for just $0.99 (INR 10 for Indian users). The Apps and games available for these prices includes Angry Birds, Wild Blood, Need for speed, Cut the rope 2, Limbo, badland, Shadow blade etc. on the games section. 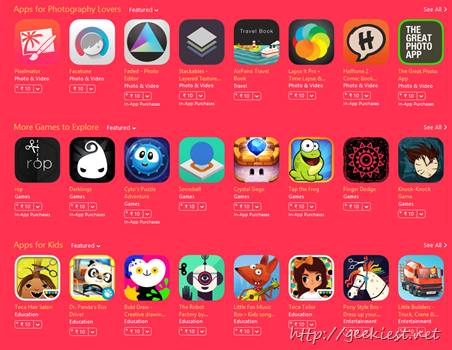 Game Hits - 23 Famous Games including EPOCH.2, BADLAND etc. Apps for photography lovers – 11 Apps, this includes Pixelmator, Facetune, The great photo app. Total 11 apps. More Games to explore – 27 Games like Go to gold, pixel soccer, Crystal siege etc. Apps for kids – 18 apps for the little ones, Dr. panda bus driver, Simple machines, Karl’s castle Toca Hair saloon etc. 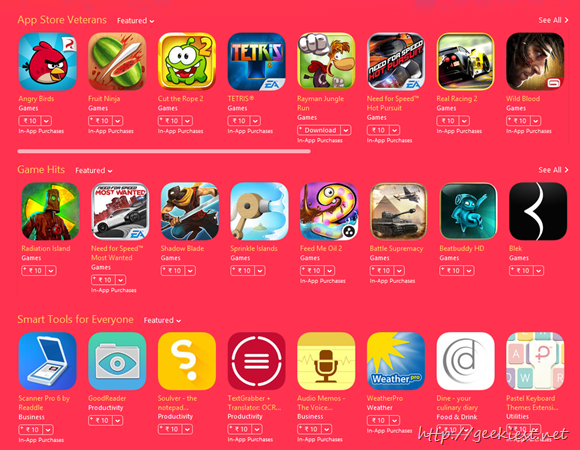 Apple iTunes store promotion, get 100 Apps and games for just $0.99 (INR 10)/ app. Google Play Store sales are now official and so are time limited giveaways.